Chetram Voyages offer a weekend trip from New Delhi to Jaisalmer via road. Here we organize a group tour which leaves for Jaisalmer from Delhi via Mandawa & Bikaner. The tour departs from Friday 6:00 AM (New Delhi) in an AC Bus and returns to Delhi by Sunday night. On Day 1 – The tour starts at 5:30 AM from India Gate. From here we will first stop at Mandawa for breakfast at around 9:00 – 9:30 AM. Next stop will be Bikaner, where we will have our lunch and a 2-hour sightseeing tour. Here we will first check in at our booked desert camp, which will be one of these – Royal Desert Camp, Rajputana Desert Camp or Dangri Desert Camp. 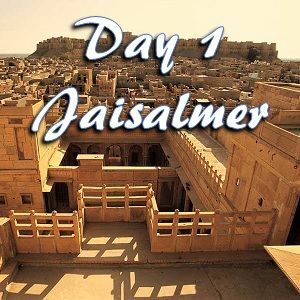 By 5:30 PM we will enjoy an hour tour of Camel Safari at the sand dunes of Jaisalmer and at 7:00 pm we will enjoy a 2-hour musical program performed by professional Rajasthani dancers. Night stay at the camp. 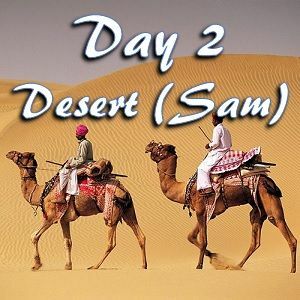 On Day 3 – We will check out from Camp by 10:00 AM (after a complimentary breakfast) and will ride back towards Delhi. On route, we will stop at Kuldhara Haunted Village, a popular tourist site near Sam sand dune.